SAN FRANCISCO, CA--(Marketwire - September 27, 2010) - AVOB (Alternative Vision Of Business), a leader in enterprise PC power management software, today announced that it is formally entering the US market. The company is opening its US Headquarters in San Francisco and has investment to start building a local team to best serve the US market. 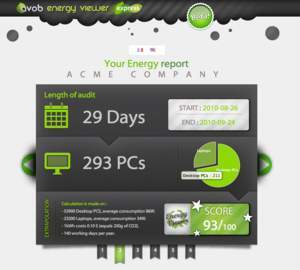 To mark its entry, AVOB unveiled Energy Viewer Express, a free new assessment tool that makes it easy for SMBs and large enterprises to get a proper estimate of their current energy consumption and carbon footprint. The tool is available for immediate download at http://www.avob-usa.com/download. "The average PC is idle more than 75 percent of the week, and when running, most users need less than 10 percent of the compute capabilities of their machine," said Pierre Duchesne, Co-Founder and CEO of AVOB. "AVOB goes beyond traditional energy saving solutions by having the unique ability to throttle power consumption during usage time as well." AVOB stands behind its technology and expected results. The company is the first in its market to have a pricing model directly based on actual savings realized by customers. Software fees are calculated based on the customer's expected savings as a result of a thorough assessment. "Our customers typically experience a ROI cycle of less than 6 months," said Duchesne. "We stand behind our value proposition and only charge them based on actual savings. It is a win-win situation!" Today AVOB also made the fourth generation of AVOB Energy Saver for SMBs and large enterprises available. AVOB Energy Saver 4.0 is the only solution on the market that maximizes energy savings when PCs are not being used and the only one that throttles the power to match the actual needs while the PCs are being used. With AVOB Energy Saver, companies can understand their exact energy needs and optimize that power consumption, shaving up to 50 percent off their energy bill. AVOB counts dozens of large enterprise customers, including Global 500 companies that have largely deployed its technology, saving over a million dollars in energy savings. "Using AVOB Energy Viewer, we have been able to precisely calculate the potential energy savings on our worldwide base of 15,000 PCs," said Cyril Didier of Essilor, the world leader in ophthalmic optics. "Over the next four years, AVOB should help us save more than one million dollars." "We took a hard look at a number of technology providers to help with the efficient power management of our 140,000 PCs," said Philippe Charpentier, Green IT Manager of La Poste, the French Postal Service. "The AVOB team not only delivered an innovative technology but also a unique business model that made it very easy to work with them." "With energy costs on the rise and concern for the environment top of mind of most CIOs, power management is an important technology for enterprises to look at," said Xavier Niel, entrepreneur and AVOB investor. "I believe that Pierre and his team have the skills and smarts to expand beyond their home market and establish the company as the worldwide leader in this market." Xavier Niel is a French entrepreneur and businessman, active in the telecommunications and technology industry. He is best known as the founder and majority shareholder of the French Internet service provider Free / Iliad (EPA: ILD) who forced France's cumbersome telecoms giants to dramatically reduce charges by challenging their dominance of the rapidly developing Internet market. Om Malik called him France's Broadband Maverick (http://gigaom.com/2007/12/21/xavier-niel-free-fr/), and he will be one of the three "Le Monde" newspaper co-owners in the coming weeks. Kima Ventures fund was created in 2010 by two serial entrepreneurs: Xavier Niel and Jeremie Berrebi. Kima Ventures partners with established investors, funds and corporations worldwide to provide seed capital and networks necessary for optimal growth of innovative startups and has invested in more than 40 Internet companies. For more information about Kima Ventures, visit http://www.kimaventures.com. Founded in 2009, AVOB is a leading provider of energy management and green technologies to enterprise customers. The AVOB Energy Saver solution presents a unique technology and business approach to the problem of energy consumption, helping companies reduce both their environmental impact and the financial cost associated with their energy bill. More than 60 enterprise customers, including Global 500 companies such as Airbus Industries, Air France and Renault, run AVOB's solution. For more information about AVOB, please visit www.avob-usa.com.